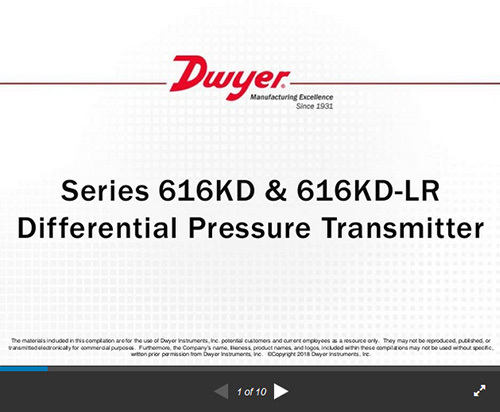 The Series 616KD-LR Differential Pressure Transmitter is designed for simplicity, making it the ideal choice for installers and maintenance professionals. These low range instruments not only alleviate cumbersome turn pots typically found in most transmitters, but eliminate entirely the need to span the instruments during calibration. With single digital push button, both ZERO AND SPAN are calibrated properly, nothing else is required. No additional reference pressure sources or separate calibration devices are necessary. ±0.25% FS for ±0.4" (100 Pa) and ±0.5" (125 Pa), ±0.5% FS for ±0.25" (60 Pa), and ±1% FS for ±0.1" (25 Pa). 1 psi max., operation; 10 psi burst. 10 to 35 VDC (2 wire), 17 to 36 VDC or isolated 21.6 to 33 VAC (3 wire). 4 to 20 mA (2-wire), 0 to 5 VDC, 0 to 10 VDC (3-wire). Current Output: 0 to 1250Ω max; Voltage Output: Min. load resistance 1kΩ. Barbed, dual size to fit 1/8" & 3/16" (3 mm & 5 mm) ID rubber or vinyl tubing, or 1/4" NPT. Vertical with pressure connections pointing down.